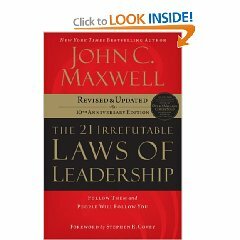 I just finished reading The 21 Irrefutable Laws of Leadership, and now I want to share the book with you! Register for a chance to receive a new copy of John Maxwell’s book. No strings attached! I will delete the registration information after the winner is selected, notified, and sends me a valid address for delivery. The book will be sent directly from Amazon.com. If the winner does not respond within five days of notification another person will be selected. Since I am paying for this out of my own pocket, the shipping is limited to the continental United States. Register now for the giveaway! The winner will be chosen on August 31, 2009. Congratulations to Sarah in Los Angels, California! She won the book this month, and her copy is on the way. Register for the current book giveaway!